"THE SKY IS THE LIMIT, THE SKY IS OUR DESTINATION!" 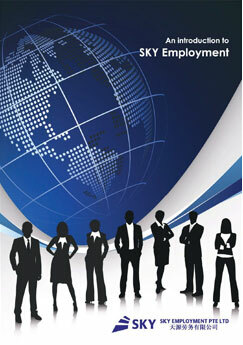 Sky Employment Pte Ltd was incorporated in Singapore since 2008. Our company is licensed with Ministry Of Manpower, license number 08C5793. We are also accredited by the Embassy of the People’s Republic of China to recruit China nationalities, certificate number EA(2010)112. Since our inception in 2008, we have been progressively advanced into a leading manpower solutions provider across all industries in Singapore. As a one-stop human capital solution provider, Sky Employment Pte Ltd intensifies the process of recruiting the potential candidates for our valued clients. To ensure a smooth, hassle free and efficient recruitment process, we also provide the necessary documentations, permit applications, medical check-ups and accommodations for the foreign candidates. At Sky Employment Pte Ltd, we deliver what we promise. Understanding and fulfilling our clients’ needs are our first priority in Sky Employment. At Sky Employment, we deliver what we promise. We value our clients just like we value our staffs. We aim to strengthen our relationship with our business partners by providing an unrivalled service at all times. In order to produce high standard of services, we benchmark ourselves to the best in the market and we shall maintain the standard throughout. Our commitment towards our clients remains steadfast in line with our sustainable growth. At Sky Employment Pte Ltd, we are committed to provide a one-stop human capital solution to our valued clients and potential candidates. We offer a comprehensive range of recruitment services. Engage the people looking for career and find a right staff. Recruiting personnel and leaders responsible for securing most suited candidates for clients’ organisation. We ensure clients are efficiently meeting all of your recruitment goals. We select reliable overseas recruiting partners and work closely to stringent the quality of the manpower.